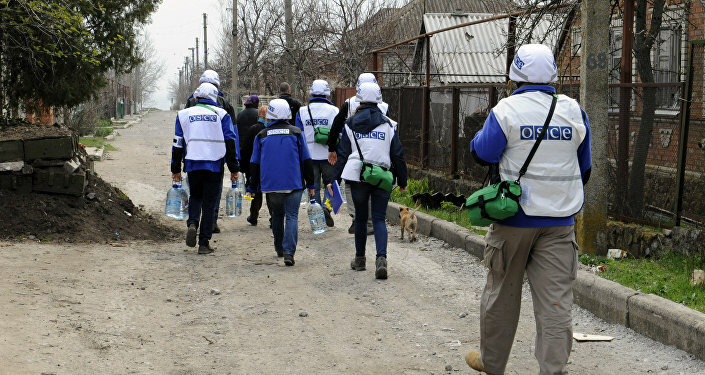 The Ukrainian government has no evidence of the alleged presence of the Russian troops in the east of Ukraine, the authorities should be less emotional in their attitude toward the issue, George Tuka, the Deputy Minister for Temporary Occupied Territories and Internally Displaced Persons, managing Donetsk, Luhansk and Crimea regions, said Monday. KIEV (Sputnik) — He added that the lack of evidence of the alleged presence of Russian servicemen in the region was also admitted by the recent decision of the Hague court, which ruled against satisfying Kiev’s lawsuit against Moscow on alleged transfers of money and weapons from Russia to the Donbass militia. Tuka added that the emotional approach of the Ukrainian politicians toward the issue, aimed at encouraging their electorate, was not a solution to the problem. "Despite all our efforts we can't yet legally substantiate the presence of Russian regular army in Donbass," Tuka said in an interview to the Apostroph online media outlet. On Monday, the National Security and Defense Council of Ukraine will hold a meeting, where reportedly the bill of Donbass' reintegration will be discussed. The military conflict in Ukraine erupted in 2014, after residents of the Donbass region refused to recognize the new Ukrainian government that came to power in what they perceived to be a coup. In February 2015, the conflicting parties signed the Minsk peace accords in order to end the fighting in the crisis-torn region. The truce, however, has since been repeatedly breached, with Kiev forces and Donbass militia accusing each other of violating it. According to the latest data from the United Nations, 10,000 people were killed since the start of the conflict. Kiev has repeatedly accused Russia of interfering with the country's interior affairs, but Moscow has, in turn, denied all the allegations. The Russian Defense Ministry has repeatedly claimed it has not supplied any military equipment or ammunition to the self-proclaimed Donetsk People’s Republic (DPR) and Lugansk People’s Republic (LPR). Russian Foreign Ministry Sergei Lavrov also repeatedly pointed out that Kiev's allegations about Russian military presence in Donbass were unfounded, since nobody has submitted any evidence yet.